As its the last day of October/Halloween,I’ve decided to do a ‘Halloween Outfit Ideas’. I’ve got 2 outfits a casual and a dressy look. So hopefully there’s one for you. 1. 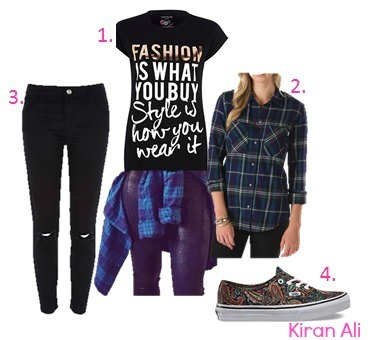 Black Fashion Style Print T-Shirt – River Island. This has a glamorous gold shine to it,with two style of fonts giving it that sassy style. 2. Rabble Flannel – Vans. This has a gorgeous blue,green colour which is great for autumn. I think it look stylish if worn around the waist with the t-shirt as well as worn over the t-shirt leaving the buttons unfastened. 3.Black Amelie Ripped Knee Super Skinny Jeans – River Island. The ripped jeans give it a scary yet elegant look adding a gothic feature. 4. Authentic Shoes – Vans. These vans are so vintage and Halloween themed the orange and black give it that sense of Autumn. 1.Dark Red Flocked Floral Scuba Skater Dress – New Look. This totally reminds me of a vampire but with such class the flower pattern just adds glamour also this would go so well with a matte red lipstick. 2.Black Lurex Diamond Print 3/4 Sleeve Bodycon Dress – New Look. This dress is absolutely dazzling – reminding me of cobwebs which would be great to wear to a Halloween party if you’re not wearing a costume. 3. Iridescent Embellished Clutch Bag, Silver – Miss Selfridge. – This clutch compliments both dresses so well. Giving them elegance,class and a fashionable look. 4. Kardashion Kollection Strappy Stiletto Sandals – Lipsy London. These heels are flawless. The two colours give it such a great appearance and shine. 5. Lipsy Millie Chain Strap Heel – Lipsy London. These heels are so chic looking. The chain keeps the look sophisticated and scary adding a slight scare but a gorgeous glamour. « Alton Towers//Outfit of the day.